Not much room to stretch out. View of 1D. The Seat:Like in my review of aisle seat 3C in this first class cabin, the seats are aging and a bit cramped in regards to seat width. But now you’ve got Mr. Bulkhead to deal with (the bulkhead wall, that is). I guess Delta hopes that free booze and snacks will make you forget that you paid a grand (or pledged your loyalty to the airline) for a seat with less legroom than even a typical economy seat (and way less than the exit row).I see no upside to this other than that you’ll be off the airplane first…and you’ll likely want to be. Service/Food/Drink: I got up quickly to use the restroom and missed out on the alternate meal choice (a sandwich), so I wound up with the Buffalo chicken salad. I’m thinking it may have been the calorie gods at work. Although I did enjoy the peanut butter brownie. Mmmm…Peanut butter. Summary: If you’re taller or wider, I say look into another flight using different aircraft if you’re flexible. If you’re stuck here, I’d say opt for a seat in rows 2 or 3. 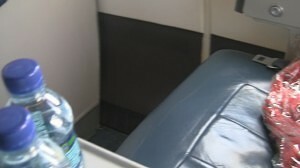 See my review of seat 3C for a closer look. 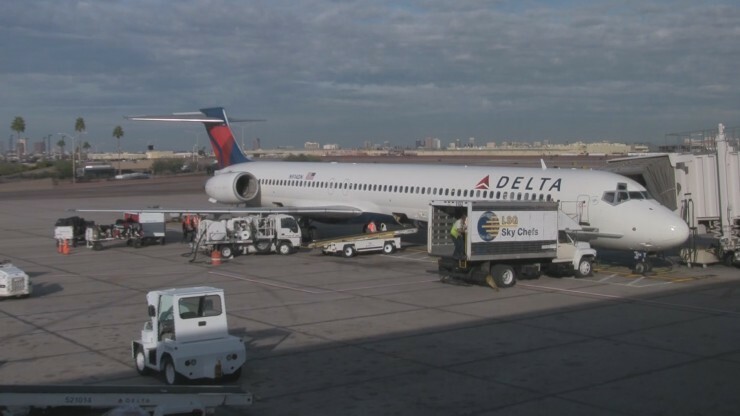 How I got it: Delta Medallion Status and weekend travel. Used status to standby for a later flight that wasn’t as full up front.